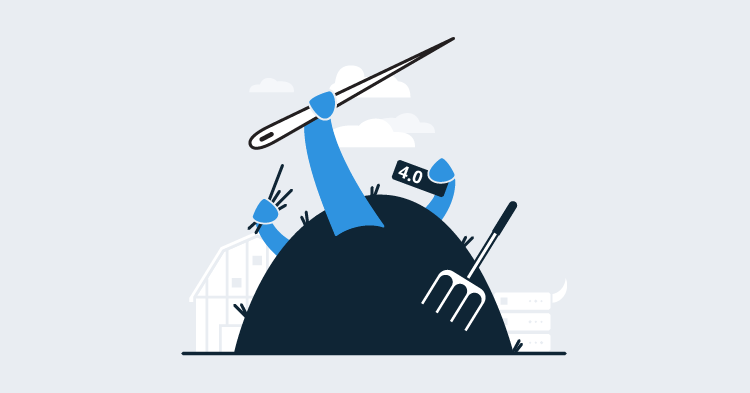 This post is a part of our Octopus 4.0 blog series. Follow it on our blog or our twitter feed. Octopus Deploy 4.0 has shipped! Read the blog post and download it today! 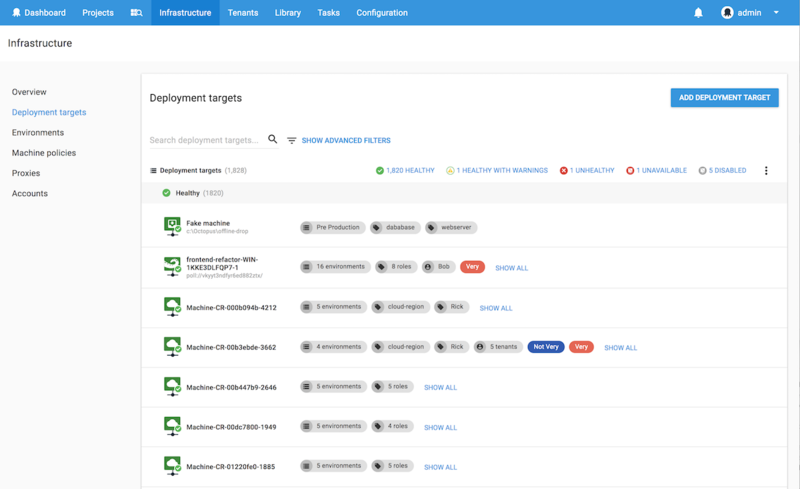 Some customers use Octopus with thousands of deployment targets, some with tens of thousands of deployments targets. 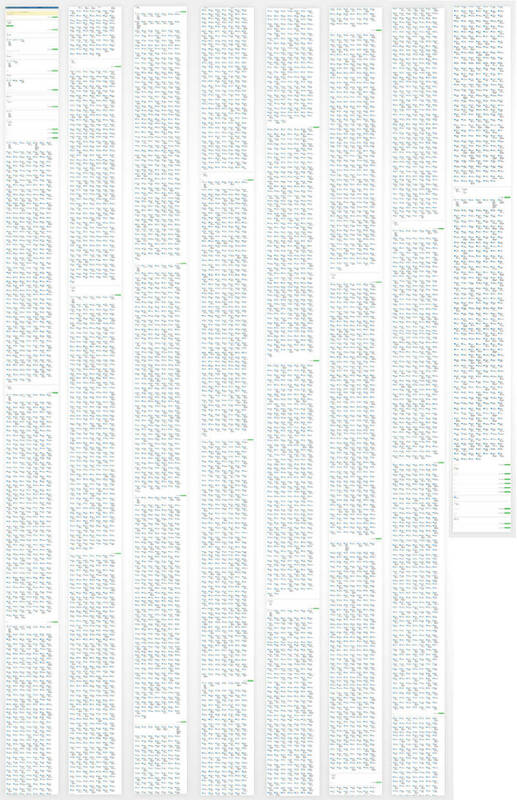 For customers operating at this scale, the rendering time to present all those targets is not great, it's not even good ... it's table-flipping material (as the page will often time-out during rendering once it reaches a certain memory limit). Add to that an inability to search, filter or page through results, and it simply does not scale. There are also customers who only have the need for a handful of deployment targets, who do not want to be crippled by a solution that caters only for customers operating at scale. Obviously the first thing we noticed was a significant amount of time being spent on rendering. No paging is implemented on this screen, so if you have, say, over 9000 deployment targets, that's over 9000 HTML line-items that your web-browser needs to generate and render (not to mention all the grouping of environments and health statuses that also needs to happen). The second thing we noticed is how difficult it is to find anything. You're left with having to Ctrl-F in your browser, because the grid-layout makes it very difficult to scan and find things quickly. 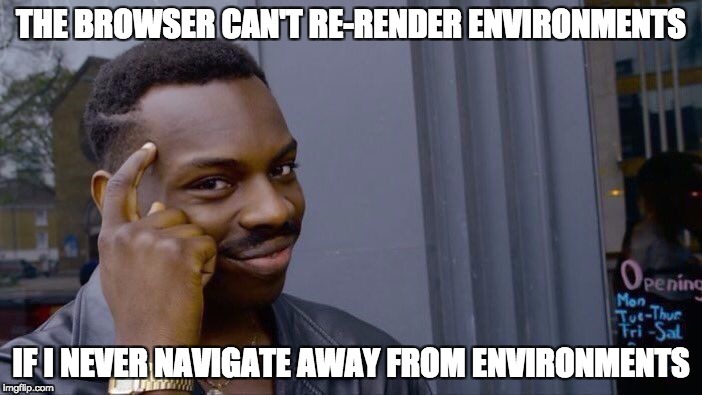 Previously, all environments and deployment targets were located in an area called “Environments”. This environments area also had links to machine policies, proxies and accounts in the top-menu, which always felt a bit "tacked on" and not really related to environments at all. So firstly we decided to clean house and create a brand new area called Infrastructure where all things infrastructure would now live (and don't worry if you have any environment-related bookmarks, we've added redirects from the old v3 routes 😉 ). 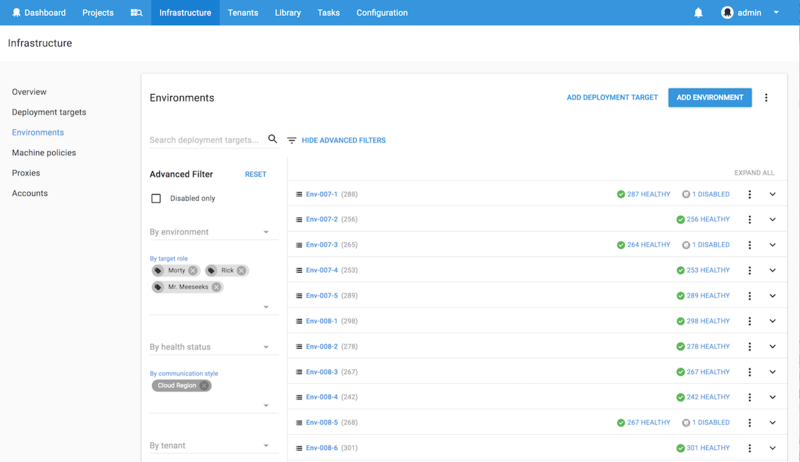 At a glance, you now get a summary of your environments, deployment targets and how they're being used with combinations of things like roles and tenants. We've found this view to be incredibly useful for knowing when some targets may be unhealthy or unavailable, and it's made the process of getting to specific types of deployment targets much easier. Want to quickly click through to your targets tagged with a "docker-server" role? Click the link and it'll take you right to them. Want to only see your Polling Tentacles, or maybe just your Disabled targets? That's very easy now. Also, for customers working with multi-tenancy, we've got you covered. 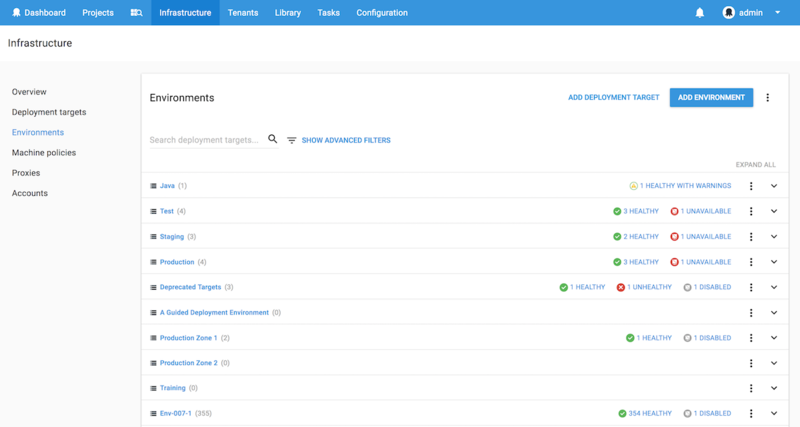 You can now very quickly find deployment targets by tenant or tenant tag set. The new environments screen takes advantage of the advanced filters available with the Octopus 4.0 redesign (and then adds even more filters per environment "We have fake doors filters like you wouldn't believe! 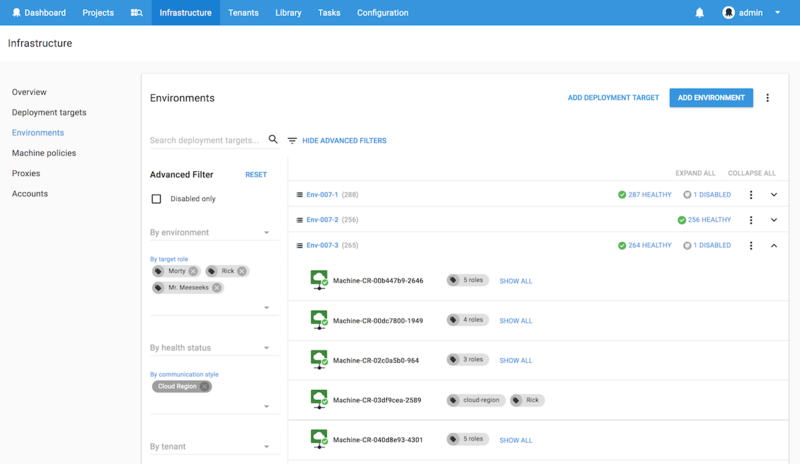 "), making it much faster to load environments and see a summary of the deployment targets contained within. This screen will be especially useful for customers operating at scale, who don't want Octopus to start loading and rendering thousands of targets until they've specified exactly what they're looking for. For example, if you're looking for Cloud Region targets with specific roles, simply expand and assign your filters and the list will refresh with the relevant environments. You can then click an environment to expand and see the deployment targets that match the criteria. 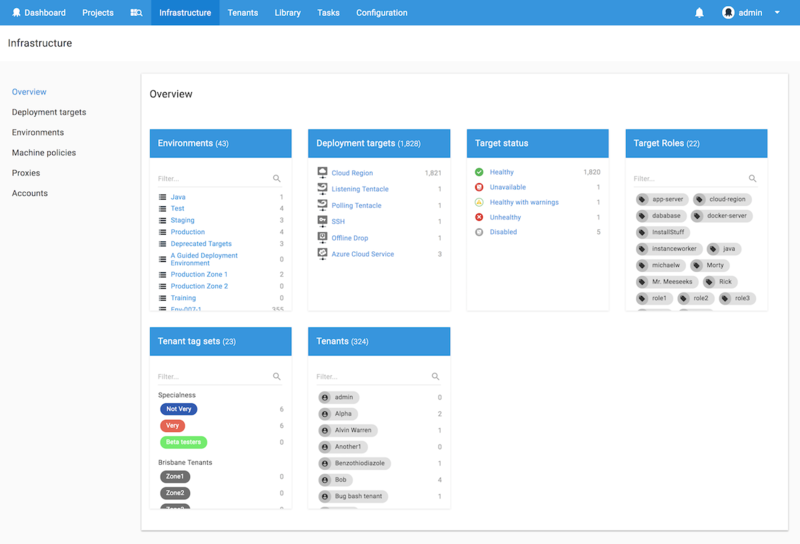 This screen contains the same search and filtering mechanisms that the environments screen has, but it shows you your deployment targets straight away. Whichever way to choose, we've added paging support on the client to cut down on rendering thousands of unnecessary targets and client-side caching support on selected endpoints to make loading as fast as possible. The filtering on these screen also includes deep links, so when you click through to a deployment target and click back, those filters will still be applied when you return to the list #NoMoreTableFlipping. Thanks for reading, and happy deployments!